If you have become a victim of Ranksonic(. )biz’s referral spam it is important to take the necessary actions to cut the spam away from your website permanently. According to experts, this referral spam has been caught to cause a storm of spam targeting both small and developed websites with its peak during the colder days. Several websites have experienced the headache of removing spam by Ranksonic(.)biz. In the hereby article we researched several methods to block the spam completely from google analytics and also prevent it via other techniques. Distribution Method Via clicking on any Ranksonic(. )biz links (For example Ranksonic(.)biz/?hrefasdi9/). By being redirected to it via a PUP (Potentially Unwanted Progra) causing pop-ups and redirects on the PC. User Experience Join our forum to discuss about Ranksonic(. )biz Referral Spam. Ranksonic(. )biz Referral Spam – What Is It? At the moment the domain itself ranksonic(. )biz leads users to the main website of the ‘service’ which advertises it as a analytics data management website, offering helpful website analytics. Infect the user with malware. Fake social engineering scams in the face of fake error pop-ups prompting users to call fake tech support to fix the problem for an expensive fee. Survey schemes promising rewarding upon entering your personal information or financial info in the questionnaire. Fraudulent antivirus software sites advertising badly coded antivirus software that slows down user PCs and shows fake virus detections to make inexperienced users subscribe and buy an overpriced licensed version. After we have examined several of the many dangers if you are a user and visit such redirecting links, let’s see what dangers this spam may be posing for the site itself. In case you have a site that is low on traffic and you are trying to research based on the traffic analytics how to improve it, this type of spam may quickly damage your data by adding the spam traffic and hence devaluating it. Referral spam is very persistent and in some cases (if conducted on a massive scale by more than one vendors and not stopped in time) it may crash the website server, causing the site do change into a ‘down’ state. Officially, referrer spam has been divided into two main categories. This type of spam attacks is called this way because the spamming program ‘crawls’ over the web to search for opportunities to spam. It is usually aimed at small and underdeveloped websites since larger sites may have various defences in the form of captcha letters and other ‘Am I a robot?’ type of checks. The spam bot devaluates statistics very fast making a relevant research based on them impossible. This spam category is less aggressive due to the fact that spider spam bots usually back away as soon as they have been spotted to avoid flagging and raise eyebrows. However, there is a big ‘it depends’ when it comes to agressiveness. This particular spam category is the most widely used type of spam because it is very developed and its attacks are more sophisticated. The word ‘ghost’ is there for a particular reason. This type of spam remains hidden for as long as possible on a site while sending out its messages. Some attacks by this type of software are so well developed that the spam bot itself may use specific tools to help it not even stay on the website it is spamming i.e. conduct the spam while not there. This makes it harder to block out and filter and extra measures are usually required. Ben Davis at vidget.com, a spam researcher, claims that this type of attacks use the free HTTP traffic data passing through to capture it and use it to mask their sessions. Ranksonic(. )biz Referral Spam – How To Protect Yourself from It? In case you have misclicked on one of the links related to Ranksonic(. )biz, make sure to use an advanced anti-malware scanner to check whether or not our system has been compromised by malware. Virus experts recommend scanning your computer more than once since some cyber-threats may regenerate. Threats such as Ranksonic(. )biz Referral Spam may be persistent. They tend to re-appear if not fully deleted. A malware removal tool like Combo Cleaner will help you to remove malicious programs, saving you the time and the struggle of tracking down numerous malicious files. Threats such as Ranksonic(. )biz Referral Spam may be persistent on your system. They tend to re-appear if not fully deleted. A malware removal tool like SpyHunter will help you to remove malicious programs, saving you the time and the struggle of tracking down numerous malicious files. Note! Your computer system may be affected by Ranksonic(. )biz Referral Spam and other threats. SpyHunter is a powerful malware removal tool designed to help users with in-depth system security analysis, detection and removal of threats such as Ranksonic(. )biz Referral Spam. 1. Install SpyHunter to scan for Ranksonic(. )biz Referral Spam and remove them. 2. Scan with SpyHunter, Detect and Remove Ranksonic(. )biz Referral Spam. Ransomware infections and Ranksonic(. )biz Referral Spam aim to encrypt your files using an encryption algorithm which may be very difficult to decrypt. This is why we have suggested several alternative methods that may help you go around direct decryption and try to restore your files. Bear in mind that these methods may not be 100% effective but may also help you a little or a lot in different situations. Note! Your computer system may be affected by Ranksonic(. )biz Referral Spam or other threats. Remove Ranksonic(. )biz Referral Spam by cleaning your Browser and Registry. Fix registry entries created by Ranksonic(. )biz Referral Spam on your PC. Combo Cleaner is a powerful malware removal tool designed to help users with in-depth system security analysis, detection and removal of threats such as Ranksonic(. )biz Referral Spam. Step 5: In the Applications menu, look for any suspicious app or an app with a name, similar or identical to Ranksonic(. )biz Referral Spam. If you find it, right-click on the app and select “Move to Trash”. Step 6: Select Accounts, after which click on the Login Items preference. Your Mac will then show you a list of items that start automatically when you log in. Look for any suspicious apps identical or similar to Ranksonic(. )biz Referral Spam. Check the app you want to stop from running automatically and then select on the Minus (“–“) icon to hide it. Remove Ranksonic(. )biz Referral Spam – related extensions from your Mac’s browsers. A pop-up window will appear asking for confirmation to uninstall the extension. Select ‘Uninstall’ again, and the Ranksonic(. )biz Referral Spam will be removed. When you are facing problems on your Mac as a result of unwanted scripts and programs such as Ranksonic(. )biz Referral Spam, the recommended way of eliminating the threat is by using an anti-malware program. Combo Cleaner offers advanced security features along with other modules that will improve your Mac’s security and protect it in the future. Hey !, I found this information for you: "Get Rid of Ranksonic(. )biz Referral Spam In Google Analytics". 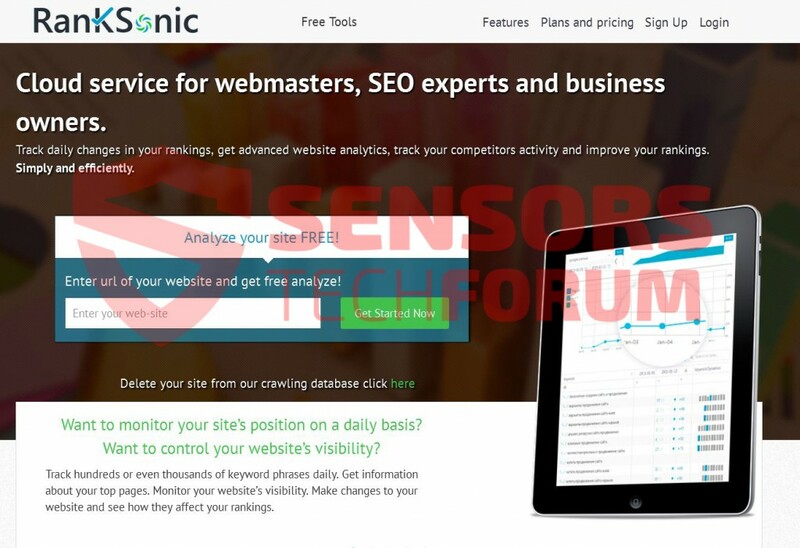 Here is the website link: https://sensorstechforum.com/get-rid-of-ranksonic-biz-referral-spam-in-google-analytics/. Thank you.